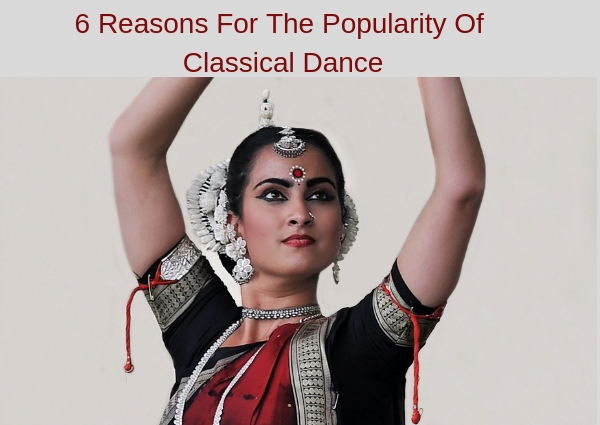 In this article, you will learn about 6 reasons for the popularity of Classical Dance. Dance is a celebrated and ancient cultural tradition in India. Folk dances can be performed all around in India in which huge crowds can be found dancing at weddings and festivals. Dance and features are heavily found in the Indian cinema and most Bollywood films. The main question is that where does Indian dance draw its room from. Bharatanatyam is the most popular dance form in Tamil Nadu. It usually performs in southern India. It traces its origin back to the Natyashastra which is an ancient treatise on theatre. It is written by the mythic priest Bharata. Originally, it is a temple dance which usually for women. Bharatanatyam dance is usually used to express devotions and Hindu religious stories. This dance form was not commonly seen on the public stage. Bharatnatyam dance movements are basically characterized by bent legs. In this Hands may be basically used in a series of symbolic hand gestures or mudras to telling a story. Kathakali basically comes from southwestern India. It is also a famous religious dance. It draws inspiration from the stories from Shaiva and Ramayana traditions. It is traditionally performed by both men and boys even for female roles also. The makeup and costumes are especially elaborate in which faces looking like enormous headdresses and painted masks. Kathak is a dance of love which usually perform in northern India. It is performed by both women and men. It is usually performed by intricate footwork accented by bell worn around the ankles and stylized gestures which is adapted from normal body language. Kathak was originated by professional storytellers and Kathakas who used a mixture of dance, drama, and song. Like any other Indian dances, Kathak also began as a temple dance but soon moved into the various cultural shows and performances. Manipuri dance originated from Manipur in northeastern India. It has its roots in that state’s rituals and folk traditions. It Often depicts scenes from the life of the god Krishna. Unlike some other rhythmic dances, Manipuri is characterized by graceful and smooth movements. Female roles are especially fluid in the hands and arms while male roles tend to have more forceful movements. The dance may be accompanied by choral singing and narrative chanting. Unlike other dance forms, it requires talent in both singing and dancing. This dance form originated from the states of Andhra Pradesh in southeastern India. Kuchipudi is highly ritualized with a formalized form of dance and song introduction. It contains burning of incense, a sprinkling of holy water along with invocations of goddesses. Traditionally this dance form was performed by men. They play this dance form in female roles. Although, it is predominantly performed by a woman. Odissi is indigenous to Orissa in eastern India. It is predominantly a dance form for women. These postures that basically found in temple sculptures. Based on the archaeological findings, Odissi is believed to be oldest of surviving Indian classical dances. Odissi is a very expressive and complex dance with over fifty mudras, it is most commonly used. Well, this was the end of the article of 6 Reasons for the popularity of Classical Dance. Looking For Singing Academy in Delhi ?